Hope springs eternal for fans of thirty Major League Baseball clubs. It remains alive for just four college basketball teams. The Sports Hangover ponders a man banned from Cooperstown delivering a Sunday sermon, wonders how numbers go as high as Miguel Cabrera’s contract, and gets NFL bad boy Conrad Dobler’s take on guaranteed contracts like the one the AL MVP enjoys for the next ten seasons. It’s Opening Day in most of America. It snowed today where I live. Thankfully, the scheduling gods have wisely delayed the Red Sox home opener for another four days. USA Today reported over the weekend that the National Climatic Data Center chronicled 2,071 record-low temperatures for March against 242 record-high temperatures. Global warming, an annual phenomenon mistaken for a permanent trend, is surely coming. It generally arrives sometime after the arrival of the boys of summer and departs sometime before their departure. After this past winter, it can’t come soon enough. Play ball! The Baseball Writers Association of America won’t let Pete Rose into the Hall of Fame. A Royersford, Pennsylvania preacher allowed baseball’s reigning hit king to take over his altar. Strange that Pete Rose can share the stage with God but not Ty Cobb and Robbie Alomar. “I want to ask him who the hell is going to win the game tomorrow, the Cardinals or the Reds?” Rose explained Sunday on what he’d ask Jesus. “Not that I’m going to bet on it.” The former Phillies player spoke to the suburban Philadelphia congregation on second chances. More than a thousand people showed up for Rose at Christ’s Church of the Valley. Worshipper Pat Shifflet told the Philadelphia Inquirer, “We’re hoping we’re getting unchurched people here.” I sense they succeeded in getting at least one. Aaron Harrison’s two-seconds-left three pointer plays as a shot for the ages. The Kentucky guard not only faced the pressure of the clock. He faced the pressure of an in-your-face Michigan defender playing him snugly. He faced a basket that stood about twenty-five feet away. Harrison’s heroics came from Larrybirdland, well beyond the college three-point arc. Despite all this, Harrison did what great players do. He overcame obstacles rather than used them as excuses. 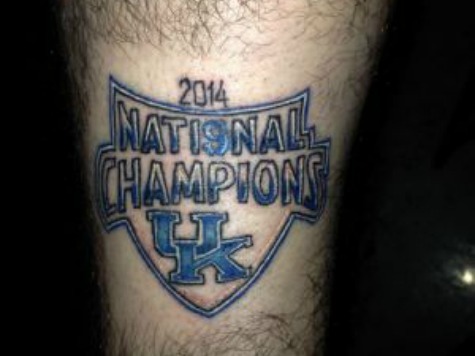 Tyler Austin Black, the Berea, Kentucky machinist who inked a “2014 Nati9nal Champions UK” tattoo on his leg weeks ago, now looks smarter than his IQ scores might suggest. How Many Dollars Have DeSean Jackson’s Friends Cost Him? Is gang life motivated by the drive for fast cash or unearned machismo? If it’s the former, the Eagles cutting DeSean Jackson will do much to rid the NFL of gang signs, tattoos, and attitudes. Chip Kelly essentially announced that he would rather eat $6 million than pay $10 million for an excellent receiver with a poor attitude and unsavory friends. Who wants to join a gang that drains one’s bank account? If it’s the unearned machismo that draws in gang bangers–think the Orphans in The Warriors carrying around newspaper clippings of their handiwork firebombing a church–then DeSean Jackson’s release won’t cause any gangbanging footballer to think twice about an Instagram imitation of a deaf person’s hand speech. Jackson, after all, looks even bolder and badder now than he did before his release. But even bad dudes have brains. They certainly grasp that Jackson’s associations have made him a sucker. The recent robbery of a quarter-million dollars in jewelry, cash, and firearms may or may not have been due to Jackson’s despicable friends. His loss of millions in salary surely has a lot to do with those friends. Money, as the Beatles reminded, can’t buy you love. They can’t buy you a win against the Padres on ESPN’s Sunday Night Baseball, either. The Padres lost the offseason free-agent race to the Dodgers. But, for one day at least, they beat the Dodgers where it matters. Seth Smith, salary $4.5 million, homered, and Chris Denorfia, the $2.25 Million Man, singled home two runs, to help defeat the Dodgers 3-1 on opening night (in North America, at least). Padres fans’ hopes for a 162-0 season live on for another day. The Dodgers and Padres play in the same NL West. But payrolls of $235 million and $90 million divide them into different money divisions. Envy at LA’s gaudy payroll will unleash mocking reactions whenever they drop one against a weak team or stumble into a slump. Get used to it, Dodger Fan. When you win with a payroll approaching a quarter-billion dollars, it’s a yawn. It’s news when you lose. Kobe probably had the right idea, at least from a marketing standpoint, when he let his play talk. Sure, he took abuse from the likes of Jason Whitlock that he was this generation’s O.J., an apolitical black athlete who allowed white America to project their fantasies upon him. But he didn’t have every opinionated blockhead in America debating his beliefs rather than his performance, which, due to injury, hasn’t been much as of late. His belated response to the Trayvon Martin-George Zimmerman case, arguing that people should take a deliberative approach based on the facts rather than an emotive one based on race, sounds like the sort of reasonable reaction that usually provokes an unreasonable response. Predictably, the Twitterverse, a land where idiocy overflows despite the 140-character-or-less constraint, erupted in bassackward observations that Bryant’s original take represented ignorance. The surefire Hall of Famer surprised no one by clarifying if not contradicting the original comments made to The New Yorker. Stephen A. Smith, not accustomed to walking back words, doubled down on the opinion Kobe effectively abandoned. Speaking of Kobe Bryant, his contract looks like a bargain in comparison to Miguel Cabrera’s. The $29 million annual salary over ten seasons makes Cabrera the highest paid player in baseball history. The reigning AL MVP had two years left remaining on his old contract. Did the Tigers really feel pressure to sign him through his forty-first birthday right now? Joe DiMaggio, Jackie Robinson, and Hank Greenberg stopped playing long before that milestone. The Detroit Tigers will keep paying, whether or not Cabrera keeps playing, right past it. I sense from my freewheeling conversation with Conrad Dobler last week what the former NFL Pro Bowl guard would think of Cabrera and Kobe’s contracts. “I would give no one a guaranteed contract,” Dobler told me last week. “You know what my guarantee was? My ability.” The St. Louis Cardinals paid Dobler, a plaintiff in two recent suits against the NFL, $17,000 in his 1972 rookie season. He now sports bad knees and suffers from arthritis.